Update: iTether is gone from the App Store. 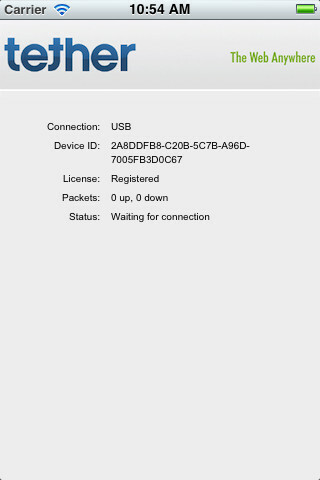 A quick test shows that the service is no longer working for tethering my iPad connection to my Mac, either. It might be because Tether.com couldn’t handle the server load from so many users trying out the service, though, so we’ll keep trying to see if it starts working again. Let us know if the app continues to be usable for you. Amazingly, Apple (s aapl) approved an app called iTether that lets you share your iOS device’s data connection with a Mac or PC over USB — regardless of whether or not your carrier allows tethering, and without jailbreaking. Even more surprising, maybe, is it works with 3G-enabled iPads, too. Tether, the company behind iTether, is no fly-by-night organization, either. The company has offered tethering solutions for BlackBerry (s rimm) devices for quite some time now, and I have often taken advantage of its services in the past. Now, it has somehow convinced Apple’s App Store review team to allow it to release an app that provides tethering even to people whose plans specifically forbid it. There’s no guarantee your carrier won’t be able to identify the extra usage and incur charges after the fact, or present you with an ultimatum requiring you to pay up, but it works nonetheless. Here in Canada, most of our carriers offer iPhone tethering as part of your basic smartphone data plan, so there is no additional fee and everything works out of the box with Apple’s own built-in personal hotspot tech. But I also carry a 3G iPad with me wherever I go, and have often thought I’d like to use that connection with other devices, since I have the plan anyway. ITether running in compatibility mode on an iPad 2 worked perfectly for me, sharing its 3G data connectivity over USB to my iMac once I managed to download and install the server application (I used this mirror, since Tether.com’s servers are taking a beating). It would be nice if I could broadcast the connection over Wi-Fi or Bluetooth, instead of having to have my iPad plugged into the computer I want to share the connection with, but it’s still nice to have the option available. ITether is in the App Store now for $14.99, but I can’t imagine Apple’s major U.S. carrier partners will be very happy about this, so buy at your own risk. We’ve requested more info from Apple about the app’s approval, and will be sure to update you if its availability or status changes.